Since finishing our Science Center recently, I've been looking for things to add to it to make it even more engaging. Every Scientist need a microscope, so I bought the My First Microscope by Geosafari for the kids. This durable plastic toy has a very low magnification, but allows kids to see the world like a real scientist- through the lens of a microscope! Pair with a lab coat to complete the effect. Since we have a microscope, we needed something to use with it. 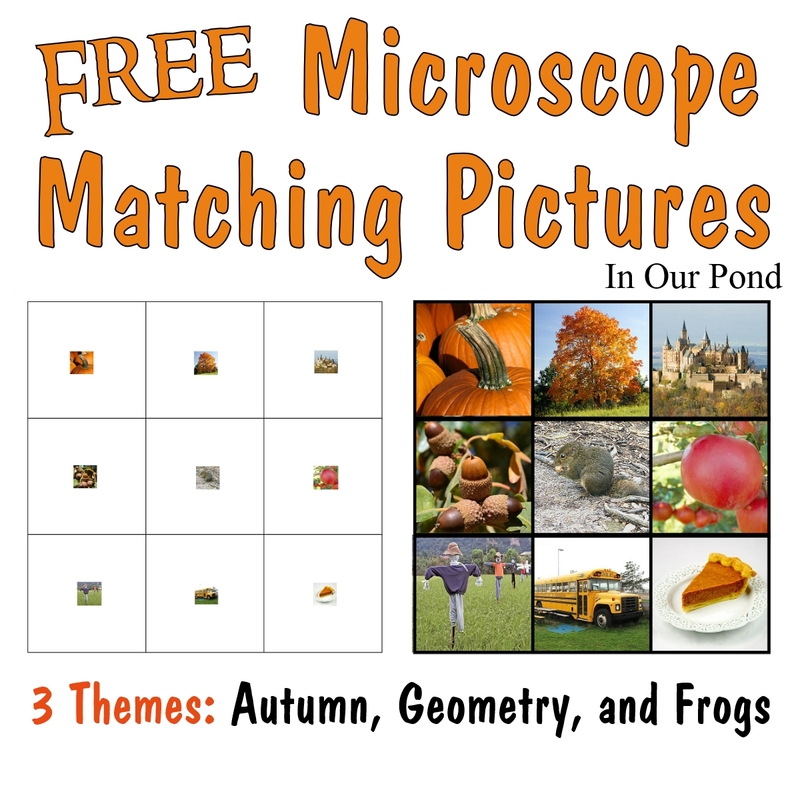 I created these printables a pretend slides for observation. 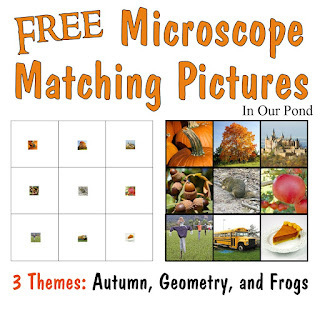 Kids can look at the smaller pictures under the microscope, and then match them to the larger pictures. I first made the Autumn pictures, in sort of a back to school theme. Apples. Pumpkins. Leaves. They should be easy to match for a preschooler. In fact, they could probably be matched with the naked eye. I got pretty fascinated looking at microscopic images and geometric patterns on Google, so I decided to do a set of cards based on geometry in nature. The small cards show items like a circular flower or the triangles in a citrus slice and the larger pictures show the geometric shape. I'm hoping that it will be a good way to introduce geometry and order to the kids. Dragonfly asked me to do a set of cards with frogs on them (she's a bit obsessed). So I did. These should be easy to match. I anticipate adding more cards as the kids develop new interests. What are your kids interested in? Comment and maybe I'll make a free printable for it! 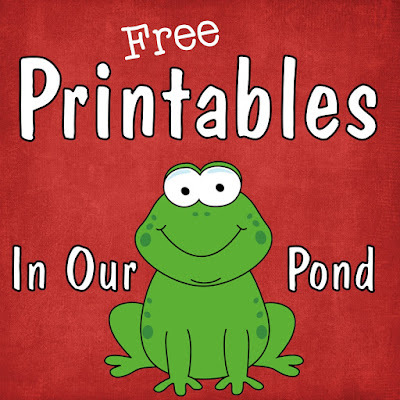 Click on the links below to download the FREE printables! If you loved this printable, check out all my others by clicking on the picture below or the "printables" tab on the menu.